The reminder to nurture the magic inside of me came when I returned to the work force in September of last year. Nurturing your magic can come in any form that is natural for you. For me, it meant remembering that I have extra energy to call on when I need it; it meant having faith in that energy. I was facing a tough transition going from being self-employed for years to working in an entry-level position in a new field. I had a nightmare, and felt stressed that I wasn’t going to be able to succeed in my new job. Lucky for me, my intuition perked up and reminded me that I could call on that special energy inside of me. Just remembering to do that was all I needed. Everything changed! I was energized and confident again. It didn’t take long to get my first promotion, either! There is magic inside of you. Nurture it, and let it open you up to all the wonder you’ve been manifesting. Now, for the workbook portion of the exercise! The Kindle version of the workbook is currently only $0.99. Signed copies of the paper workbook can be ordered directly from me. I know that I am good at nurturing the magic inside of me. I trust that I am good at nurturing the magic inside of me. I love that I am good at nurturing the magic inside of me. I accept that I am good at nurturing the magic inside of me. Pg. 14 of the workbook has a space for what you know is true about yourself. If your meditation with the words, “I know that I am good at nurturing the magic inside of me,” energized you, comforted you, or in some way felt like it was the one, this is where you’ll write the phrase in and date it. You know how much fun it is to look back on those entries! Pg. 16 of the workbook is where you’ll write the words, “I trust that I am good at nurturing the magic inside of me,” if this is the phrase that gives you a good feeling, energizes you, or in some way adds something to you. Pg. 17 of the workbook is the place to write, “I love that I am good at nurturing the magic inside of me,” if this is the phrase that gives you that loving feeling. Pg. 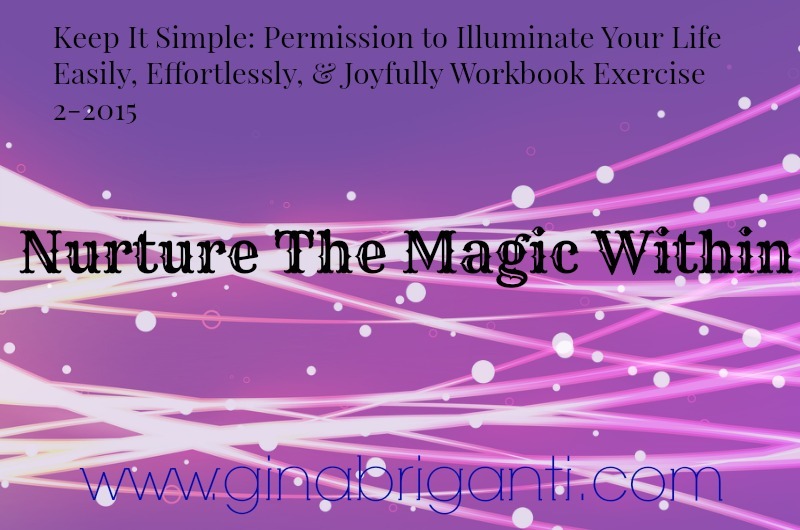 18 of the workbook is where you can write, “I accept that I am good at nurturing the magic inside of me,” if this is the feeling that resonates most for you. I hope you’re receiving my newsletter, but if you’re not already receiving the exclusives and announcements there, sign up right away so you don’t miss out on any more of them.